This exceptional antique George IV English sterling silver teapot has a circular compressed form onto a plain circular spreading foot. The upper portion of the body of the teapot is encircled with an impressive band of chased decorated floral designs flanked with bead ornamentation. The lower portion of the body is embellished with a contemporary bright cut engraved crest depicting a pheasant holding in the beak a fleur-de-lis. The flared, tapering shoulders of the teapot has an impressive gadroon decorated border to the rim. This silver teapot is fitted with a hallmarked flush hinged panelled cover; the flush hinge indicates the fine quality of this piece. The cover retains the exceptional sterling silver finial modelled in the form of an interlacing, coiled snake; securing to the interior with a screw fitment. This exceptional example of antique teaware retains the original ribbed, carved ivory C shape handle featuring a plain scrolling thumbpiece. Both the upper and lower sockets of the handle are embellished with exceptional chased decorated snake terminals in junction with the body. 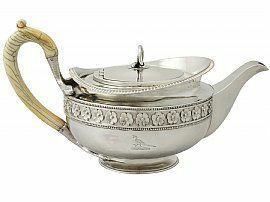 The teapot is fitted with a plain, fine and impressive swan necked spout. The formation of this exceptional example of George III silverware, crafted by the renowned London silversmith J W Story & W Elliott, reflects the design and style of the highly collectable silversmith Paul Storr. Learn more about the types of teapots. This antique Georgian teapot is an exceptional gauge of silver, exceptional quality and in exceptional condition. There are some natural fire marks to the surface of the teapot, in keeping with age. The original ivory handle has natural crazing in keeping with age; this does not affect the integrity of the piece. Full hallmarks struck to the underside and part hallmarks to the interior of the cover are all very clear. Length from back of handle to tip of spout 27.6cm/10.9"
Height to top of thumbpiece 15.3cm/6"